When you activate a webOS 1.x device, the first thing the phone does is search for a cellular signal or SIM card (for GSM phones). Even if you have an active Wi-Fi connection available, if it is not an active device on your cellular account you will not be able to do much more than just turn the phone on. If your phone is a GSM device and you have a friend with an active SIM card, you should see if you could borrow it to activate your device. Once activated, just take out the SIM card out and the device will run just fine. Otherwise, there is a developer tool available that will allow you to bypass the activation requirements, thus allowing you to use your phone as a Wi-Fi only device. Unfortunately, there are a number of limitations of developing on an Unactivated Devices. 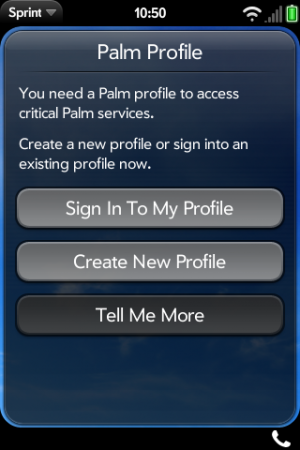 You are unable to log in to a Palm Profile, access the App Catalog, get any OTA webOS updates, or use the Phone or SMS functionality. Here comes Homebrew to the rescue! Specifically, developer Arthur Thornton to the rescue! He has created a patch that will allow you to create or login to a Palm profile on a activation-bypassed device, thus removing all the limitations above with the exception of providing Phone/SMS functionality. Continue reading after the break to learn how to bypass the activation and then log in to your profile. Once the device boots, it will already be in developer mode. Just activate Wi-Fi and the device will be ready to use, subject to the limitations of non-activation. Plug in your device to a computer and select "Just Charge". Then do a search for the "Show FirstUse App" patch and install that patch, too. Once the phone is back up, you should see a new app called "First Use". Open that app and follow the steps to log in or create a new profile. At the end of the process, you will get to a screen saying "Setup Complete" with a standard webOS spinning progress circle. Manually Reboot your device again. When the phone comes back up, you will have full access to the device, the App Catalog, and everything else that does not require a cellular connection or phone number.